The Sweet Sommelier: Bring on the Bubbly! The beautiful bride has walked down the aisle. The handsome groom has said his vows. The newly married couple has shared their first kiss. Now the celebration begins! And it wouldn’t be a true wedding celebration without breaking out the bubbles to toast the Mr. and Mrs. Sparkling wines are a must at wedding celebrations. Though bubbles come in many different kinds and styles, a great celebratory wine must be refreshing and graceful, just like the happy couple. Colby and Ashley on their special day. When most people think of sparkling wine, they think of Champagne. However, true Champagne is the sparkling wine made in the French wine-making region called Champagne. Champagne is made from a blend of red and white grapes that actually go through a second fermentation process while in the bottle. This fermentation creates carbon dioxide that is reabsorbed into the wine, thus creating the bubbles. This is called “Methode Champenoise” or “Methode Traditionnelle,” so even though only wines from this particular region of France are true Champagnes, many other wines around the world go through this same process. Drinking real Champagne at a wedding is a wonderful gesture, but when most Champagnes cost $35 a bottle or more, it may not always fit into a wedding budget for all the guests to toast the newlyweds with Champagne. If Champagne is on the menu, there are some amazing producers that make breath-taking wines. Of course, everyone has heard of Dom Perignon and Cristal, both retailing for just under or well over $200 per bottle. Other Champagnes with fewer zeros in the price are produced by Moet and Chandon and Veuve Clicquot. Of course, if producer is not an issue, just look for the word “Champagne” on a bottle, and you will be enjoying one of the world’s most renowned sparkling wines. If Champagne is not in the budget or on the wish list of the wedding planners, there are other sparklers from around the world that are equally amazing for a wedding toast…and most are a bit more budget-friendly. Cava is the sparkling wine made in the northeast region of Spain near Catalonia. Cavas are produced using the same classic method of Champagne, so these wines make a great alternative for toasting at less than half the price per bottle. Producers to look for if choosing Cava are Codorniu and Freixenet (in the black bottle). Justin and Krishna celebrate their nuptials. Yet another option for a sparkling wine toast is to purchase Prosecco from Italy. These wines are known for having slightly larger bubbles and being less crisp than Champagnes or Cavas, yet make for a great wine for wedding receptions. Again, the price is going to be less than half the cost of Champagnes while still drinking a quality product. Look for Prosecco on the bottle or these reputable producers: Bisol and Masottina. Though Europe has been producing sparkling wines for centuries, you can also find wonderful bubbly in the United States. If you are looking for a higher-quality sparkling from the U.S., make sure to look for the terms “Methode Champenoise” or “Methode Traditionnelle” on the bottle. Due to American wine laws, these are the only terms to tell how the wine was made. Of course, California makes some amazing sparklers. Look for the producers Gloria Ferrer, Domaine Carneros, Schramsberg, and Roederer. New York State is also moving toward making quality sparkling wines; Dr. Konstantin Frank is leading the way. Gruet, from New Mexico, is also a great bet. Chancie and Aaron say "Cheers"! These are not the only sparkling wines made around the world. All countries make some sort of bubbly. Other terms to look for on wine bottles that may help find a sparkler include cremant, sekt, frizzante, spumante, Blanquette de Limoux, and Franciacorta. These words either mean the wines are a sparkling style or are produced in a region that, by law, are required to make sparkling wines. Bubbles also come in many dryness/sweetness levels, anywhere from very dry to very sweet. However, these levels can be confusing; when the term “dry” is used, it does not actually refer to the driest wines. The driest sparklers are called Brut Zero (though these are not as common in the U.S.). Brut means dry. Extra Dry actually means not as dry as a Brut but off-dry. Sec is semi-sweet, Demi-Sec is sweet, and Doux is very sweet. Though these are the French terms, they are used fairly universally for other European and American sparklers. Of course some bubbly wines, like Moscato d’ Asti, will always be sweet, even if they don’t have any of the above terms on the label. With so many options, it can be hard to decide. However, like most wedding decisions, budget might play a part in the celebratory toast. If budget is no issue, treat your guests to true Champagne or a quality sparkling from one of the great producers mentioned earlier. When trying to stay within a budget, wedding planners can have a special (more expensive) bottle of sparkling for the bride, groom, and bridal party to toast with, and then have a quality—yet less expensive—option for all of the guests. Of course, like with any product, cheap options can be found. These might be wines that are made from a method other than the classic method to make them sparkling…and that’s okay. The most important part of this special day is not the brand of sparkling wine, but the bride and groom that are being toasted with that wine! 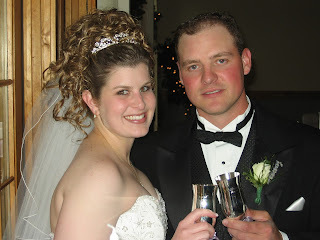 Jeff and Jaimee enjoy their first sip as husband and wife. The final, and absolutely most important, note on sparkling wines, however, is the serving temperature of these wines. Sparkling wines MUST be served COLD, as cold as the wine can get! Even the most expensive bubbly will not taste its best if it is served at room temperature or warm. In fact, for many years, I believed I didn’t like sparkling wines because of too many wedding receptions where I had hot bubbly. Make sure to keep the sparklers in a restaurant-grade, very cold refrigerator just until it is time to pop the top. Ask for volunteers or have the event-location staff help to open and pour the bottles just before time to toast. If there are still bottles with wine in them, make sure to put these bottles on ice so they can be consumed cold during the remainder of the wedding reception. After the bride has lifted her veil and the groom has professed his love, it is time to celebrate this beautiful new union! These celebrations include special speeches, loving dances, and festive toasts. Sparkling wine is an important part of this tradition. 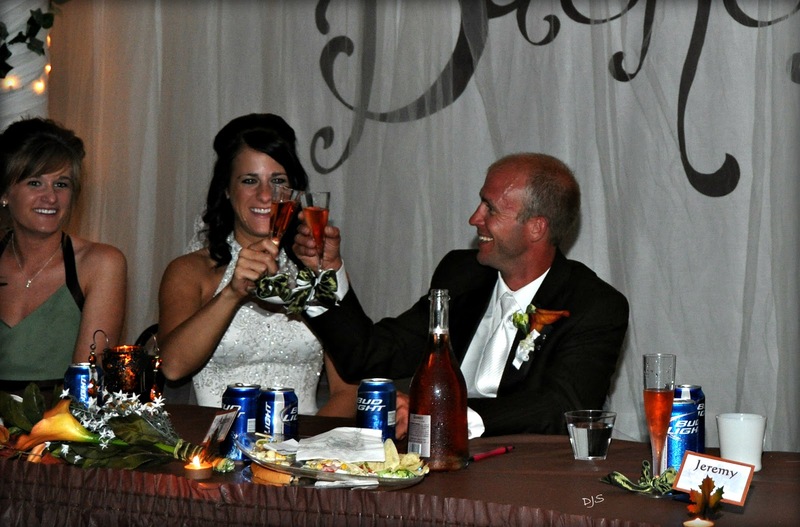 No wedding day is complete without the pop of a cork followed by a joyful “Cheers” to the newlyweds! Congratulations!